Having found the Isle of Arran it is hard to believe that we had never visited it before! It is not too long before you arrive at Ardrossan from Cumbria and there is a 7am ferry for convenience! We decided to leave late Friday and sleep in the ferry port before catching the ferry to an island sometimes referred to as 'Scotland in miniature". We arrived in Broddick just under an hour after setting off. Looking a little dull on the weather front! We had booked on Seal Shore Camping in Kildonan but decided to take our time cooking bacon butties overlooking Holy Island and Lamlash Bay. The weather leaving Ardrossan was very dull but it improved constantly throughout the weekend. We arrived at Kildonan which was a very short drive away from Lamlash around about midday. The view from the campsite with the Isle of Pladda and it's lighthouse for company as well as Ailsa Craig in the distance was superb! Not a bad view from the Campsite! As the weather was still threatening with heavy showers (the campsite pictures were taken on the next day!) we decided to explore the coast line from the campsite and look for the Black cave. We purchased the cicerone guide for the island which never disappoints with great detail and insight into the surrounding area. The walk was a mix of beach, stones and the odd dodging of the tide. An added bonus was the passing of the seal colony! Having sea kayaked past many on our trips I don't ever remember passing a colony on foot! They were however not phased at all! We soon realised that we were racing the tide if we wanted to see the cave as it does get cut off! Away from the village the coast line turns to high steep cliffs and rocky shores. We soon reached the cave but had to be quick if we did not want wet feet! There was a little panic setting in!! The walk back was very pleasant and we felt very relaxed in such awesome sceney. It was back to study the map and discuss tomorrows adventure. The next day we had planned to get on the bikes over to Lamlash Bay and have some lunch before finding some off road thrills on the way back. We had looked at websites for information but with any riding locally, local knowledge is power and although not disappointed we did not find the thrilling mountain biking side of Arran! We left the campsite and headed North on the road. The weather was significantly better and we were enjoying the undulating roads that the island has to offer! On route we passed Arran motor cross club riding on the track. This was a great facility and there seemed to be some talented riders about! What a great place to ride! We contiued up the coast before hitting a great little climb on the road over to Lamlash Bay on a road called the 'Ross' not far past the village of Lagg. It reminded me of a lakeland climb through the valley! The descent the other side was fantastic with a great view. At Lamlash we ordered a lovely bar meal at the Lamlash Bay Hotel. The food and service were great! It was soon time to go in search of some off road magic! We headed back the way we had come and then turned off through the forest. The ride entailed grinding up forest roads back over the top to Kildonan. There was singletrack in the forest but with the very likely hood of getting lost we decided to have a leisurely cycle back! The weather had been great all day with the exception of the ever present coastal wind! Our leisurely cycle had taken its toll and it was time to make the most of the sun before the next day in the hills! A little tired after a big lunch! The next day the weather continued to be fantastic. We could not believe our luck! Although September normally has a period of settled weather within it!! Out of the cicerone guide we decided to walk the Corrie and Goatfell walk. The walk leaves the village of Sannox on the north west coast of Arran. The drive was extremely pleasant and the walk was not going to disappoint! We decided to park between Corrie, the end part of the walk and Sannox village, the start of the walk, to limit the amount of road at the end. The walk into Glen Sannox is stunning. A panorama of mountains stretches as far as the eye can see! Admiring the view up the Glen! The first peak was Cioch na h-Oighe. The path up was narrow on steep ground followed by a scramble! We did what most people did and climbed too high to miss the path, two locals we met at the top had explained that this was usual! What this did do was put us on some dodgy scramble which was enough to get the adrenalin going! Awesome views though! On top 661m high, we sat for quite a while admiring a fantastic view that stretched for miles around Gleb Sannox! After a quick bite to eat we made our way along what is described as a roller coaster ridge. The path leads to Mullach Buidhe a little higher at 830m. From here there was a clear view ahead around Glen Sannox and towards Goat Fell. The ridge runs across to North Goat Fell 818m. The path soon leaves North Goat Fell and onto the Stacach ridge. There are a few options for routes along this ridge. It took us quite a while to get across as the photographic opportunities were endless! 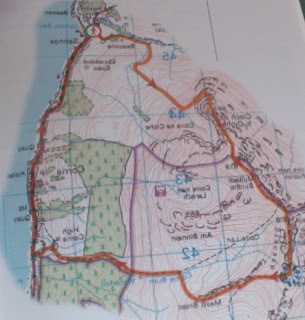 The last part of the ridge takes you to the summit of the most famous peak on the island, Goat Fell. It is the mountain that greets all the tourists off the boat overlooking Broddick! The summit is a table of granite with a few large boulders, trig point and a view indicator. It is the highest mountain on Arran at 874m. The walk off Goat Fells follows a ridge path east. The shoulder at Meall Breac is where we left the main path from Broddick. The path back to Corrie was rough but easy enough to navigate following the burn. After passing a few deer fences we soon found ourselves on a steep road down to Coire. The walk back to car was painless and gave yet more time to admire the stunning coast line of Arran. It was time to head back and discuss the days experience over a well deserved tea! The next day it was time to head back to Broddick to catch the ferry to Ardrossan. We decided to take the coast road North and drive around the whole island before heading back. The North of the island was just as stunning and we vowed that we would be back armed with sea kayaks next time!